David and I just went to Bed Bath for an air conditioner, and came out with a Eureka vacuum (and towels, and a Nicole Miller bathrobe, and a new soap dish, and a new lint sponge thing...). I am in love with my new appliance. 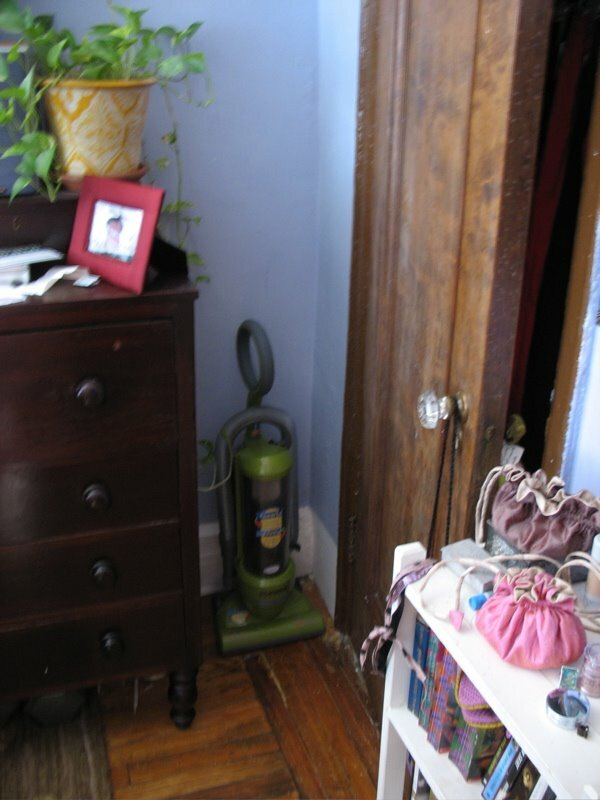 Not only is it small and green, like a Kermit, but it has the same power as my larger, more expensive upright Dirt Devil vacuum that hogs the corner of our bedroom collecting dust. 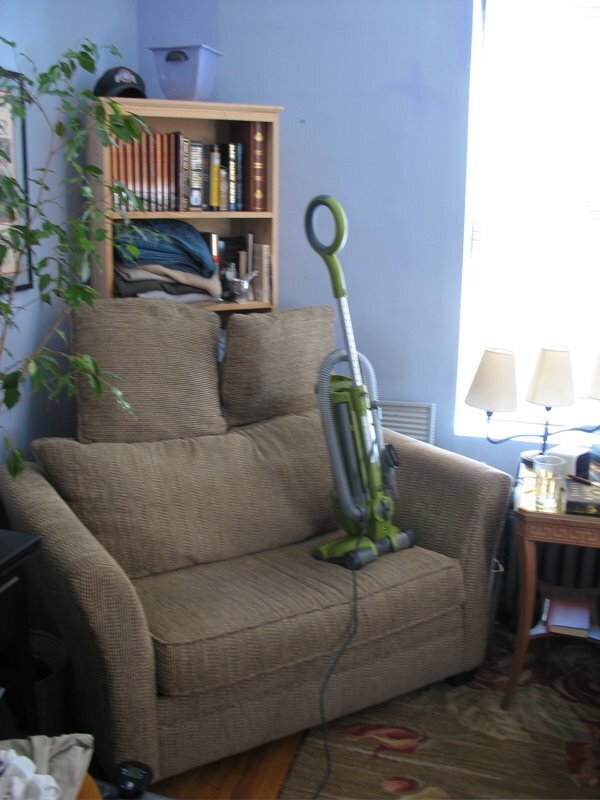 Being in a house of dogs, cats, fabric scraps and thread, the Eureka vacuum cleaner is my new best friend (in with the new, Aveda Smoothing Fluid). 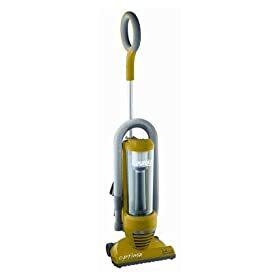 This is a great vacuum for apartments, as it's 1/3 less the width of a normal vacuum cleaner (which means, though, it holds a little less dirt), is $59.95 at Bed Bath, has an adjustable handle, and is much quieter and lighter. Many of you may already have this, so I'm a little behind the times. Our bedroom is the only room with a carpet, but most of my vacuuming satisfaction comes from upsetting dust bunnies and sucking them into the plastic container, where they swirl around in what looks like a tall ice-tea plastic picture, until they meet their new home. The one drawback I have to mention is that it blows out air when the brush is off. Not sure why it does this, as it kicks up the dust. 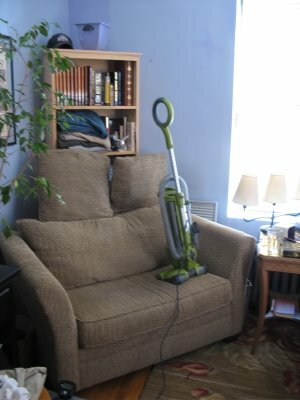 But just as oddly, the dust gets into this wind current and most of the time gets circulated back to the vacuum and vanishes in the suckage, but I could be using one of the settings wrong. I don't think I missed any dust bunnies. Buy it now from Amazon, or cab it to Bed Bath for a possibly cheaper price. 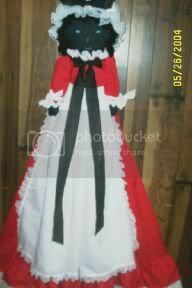 Mine does not take the shape of a pig in ruffles, nor does it personify anything. 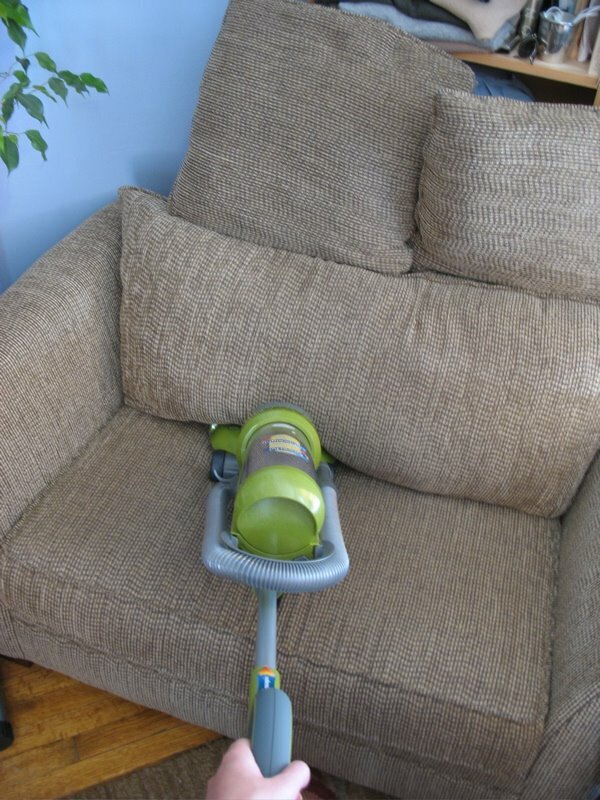 It is more of a Casper the Friendly Vacuum Cover in cool fabric so that it can be just another piece of furniture in my room. It's a little too big. I need to take it in. My vacuum cover needs alterations. It’s not ready for prime time. But I’m thinking of having a “Vacuum Friendly” section on katie-james.com.